New AMSOIL DOMINATOR Synthetic 2-Cycle Racing Oil is a robust formulation specially engineered for unsurpassed protection in high performance two-cycle motors, both on and off the track. It contains heavier synthetic base oils that provide more lubricity for on the edge operation. DOMINATOR reduces friction and protects pistons and bearings subjected to the rigors of racing. DOMINATOR contains the right additives for clean motor operation. 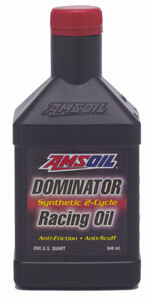 All major two-cycle racing turns to DOMINATOR, an AMSOIL exclusive formulation. DOMINATOR®, an AMSOIL exclusive formulation, lubricates and protects high-performance two-cycle motors, both on and off the track. High-performance motors, particularly those that are modified, operate hotter and at higher RPM than recreational motors, and they need good oil for peak performance. DOMINATOR is engineered for racing. It has the right film strength and clean-burning properties for “on the edge” operation. DOMINATOR is recommended for use in high performance stock or modified two-cycle motors, including air or liquid cooled snowmobiles, personal watercraft, motorcycles (Moto X), ATV's, go-carts and outboard motors*. Good for use with coated or non-coated pistons, high-octane racing fuels and exhaust power valves. Compatible with most other two-cycle oils, however, mixing oils should be minimized. #1 the Amsoil Quickshot SE for the fuel - prevents water seperation and ethanol problems throughout the entire fuel system - Product of the year a SEMA 2010 by the way! #2 Amsoil Power Foam for instant clean-up of intake and valve carbon issues as well as an overall degreaser and parts cleaner.